The Mustang bounced back from a dip in sales in April by posting excellent numbers in the month of May. Customers snapped up 9,761 Mustangs last month, which represented an eleven percent increase compared to 2013 and the best sales month so far in 2014. Overall Mustang sales for 2014 are up 8.1 percent compared to this same time last year, 36,600 versus 33,868. Overall Ford Motor Company sales were stellar, up three percent overall and up six percent for retail. The Ford Fusion and Ford Escape both set all time monthly sales records, and the Explorer had its best sales month since 2005. You can see a complete breakdown of Ford Mustang monthly sales in the chart below. 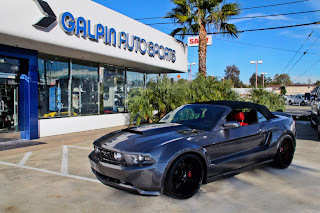 This entry was written by by Drew Phillips (Mustangs Daily) and posted here on Wednesday, June 4th, 2014 at 3:45 pm and is filed under ford mustang sales, ford mustang sales numbers, mustang sales, mustang sales numbers, News. This article was not written by us, rather gathered using RSS feeds listed here. We take no credit for this article. You can leave a response, or trackback from your own site.